We are currently seeking talented and motivated postdoctoral candidates to join our group at the University of Maryland, working at the Laboratory for Physical Sciences on integrated optomechanical devices. Our laboratory offers state-of-the-art research facilities, including access to nanofabrication facilities at LPS and through the Maryland Nanocenter, optical waveguide measurement, and high-speed photonic characterization tools. The successful applicant will participate in existing projects and contribute to advancing our research program by investigating novel concepts and devices and proposing new ideas. The University of Maryland and the Laboratory for Physical Sciences are located in the Washington DC Metropolitan area, which is not only a great place to live, but our proximity to many nearby collaborators, universities, and government laboratories makes it an ideal place for a young scientist to launch a career. The University also offers good benefits and competitive salary. Many phenomena in natural and engineered systems are both spatial and temporal, meaning that they involve dynamical changes and movements of nonuniform patterns. 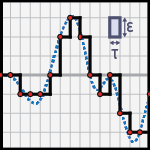 Examples include wave propagation, heating and cooling, chemical reactions, and diffusion. The ability to visualize these phenomena is fundamentally limited both by how fast they are and how small they are. We are seeking a creative and motivated postdoctoral scholar with experience in ultrafast time-resolved measurements and/or near-field nanoscopic measurements. The selected individual will play a leading role in developing and applying a new time-resolved near-field microscope system that can resolve nanoscale spatial structure, while simultaneously measuring ultrafast dynamical effects. You will be working closely with an interdisciplinary team of faculty, graduate students on applications that include 2D optoelectronics, photovoltaic materials, integrated photonics, and plasmonics. You will have access to state-of-the-art ultrafast laser systems, near-field microscopes, nanolithography facilities, and an array of materials characterization tools. You will be expected to attend and present research at leading conferences and publish your work in the open literature. Interested applicants should email Thomas E. Murphy (tem@umd.edu) with a CV and list of potential references. The position is available immediately, and will remain open until filled. For best consideration, please submit application before Monday February 11, 2018. The University of Maryland is located in the Washington DC Metropolitan area, which is not only a great place to live, but our proximity to many nearby collaborators, universities, government laboratories, and sponsors makes it an ideal place for a young scientist to launch a career. The University also offers excellent benefits and competitive salary. 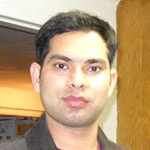 Congratulations to Prof. Gagan Kumar (postdoctoral alumni from group) who was recently promoted to the rank of Associate Professor of Physics at IIT Guwahati. Congratulations to Kate Coppess (who was an undergraduate researcher in our group through the TREND REU program), who was chosen this year to receive an NSF Graduate Research Fellowship. 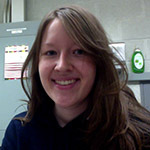 Kate is currently studying Biochemistry at Stanford in the group of Rhiju Das. 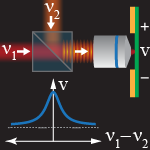 Check out our recent invited perspectives article entitled “Recommendations and illustrations for the evaluation of photonic random number generators,” which was published this week in APL Photonics, and featured in an AIP Scilight piece. We offer a fresh perspective on the rapidly developing technology of optical random number generation, and offer our recommendations for how to measure and extract entropy from optical processes. 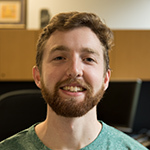 Nathan Super joins the lab this summer through the NSF-sponsored TREND program. Nathan is currently pursuing his bachelor’s degree in Physics at William and Mary College. 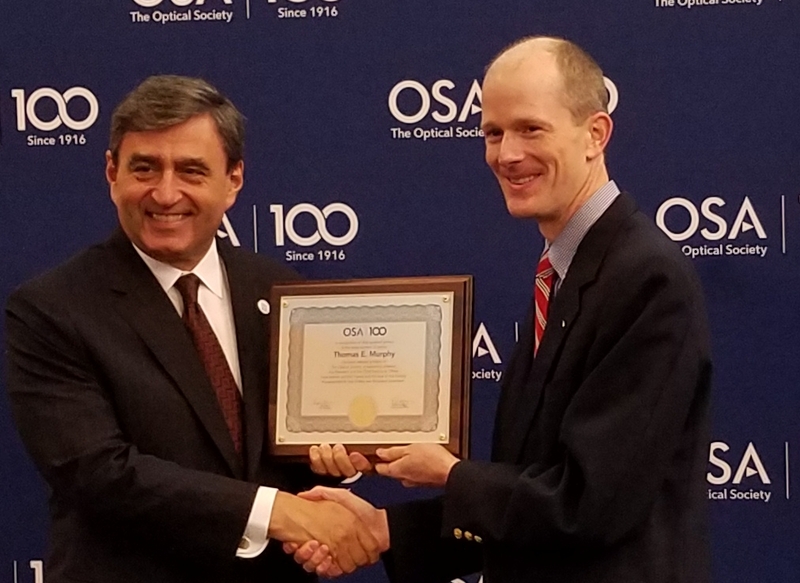 Prof. Thomas E. Murphy was named as one of 96 individuals among the newest class of 2017 OSA Fellows, for “sustained contributions to nonlinear, electro-optic, and ultrafast processes in nanoscale materials, integrated photonics, devices, and systems.” The OSA fellow citation was presented this week at CLEO 2017 in San Jose, CA. On Monday 4/3 at 3:00pm in ERF 1207, Dr. David Pile (Senior Editor, Nature Photonics) will give a seminar about how to publish in Nature Photonics. Bring your difficult questions! Prof. Amir Ali Ahmadi (Princeton) was selected this year as one of only 126 individuals in the US to win an Alfred P. Sloan Foundation Fellowship. Amir was an undergraduate researcher in our laboratory in 2005, and although he is currently studying operations research and financial engineering, as a Maryland undergraduate student he published a paper in the Journal of Lightwave Technology and presented his work at the Optical Fiber Communications conference. Our paper entitled “Tunable Ultrafast Thermal Relaxation in Graphene Measured by Continuous-Wave Photomixing” was published this week in Phys. Rev. Lett. and was highlighted as an Editor’s Suggestion. Only about one in six PRL papers are so highlighted, based on work that is judged to be particularly important, interesting, and well written.